The first Weather Port, just south of the Coleman Building, houses an unusual side dump box truck and two generators which originally came from Mt. Palomar Observatory in California and were slated for electricity production in Taylor Park. Built in 1879, this is one of the original cabins constructed by Jack Howe to house the many miners and freighters who passed through the East River Valley as the mining rush began in earnest. Moved from “Jacks Cabin” in 1937, it has been a useful structure for more than a century. 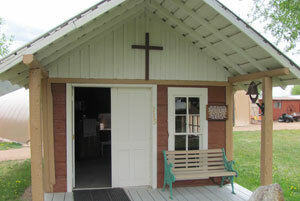 The cabin was a gas station until 1996 when it was moved to the Pioneer Museum. It is now furnished to resemble an early rural chapel. The Endner Building was formerly located in Jorgensen Park west of the museum. 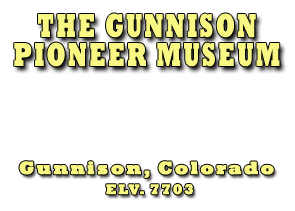 It was donated by the City of Gunnison in 2008. This building houses a Tucker Snow Cat, carriages, a homemade tractor made from a Model A Ford and 4 Maytag washing machine motors.